All Metal Works tornado shelters meet or exceed all of the industry standards when it comes to metal thickness and quality of construction. They also meet or exceed the national standards for materials and design. We offer many standard sizes with or without installation prices, and can custom build to fit your space or needs. Our storm shelters, tornado shelters and safe rooms feature 3/16" steel plate covering the walls, ceiling, and doors, also 2"x 2" square tubing with 3/16" wall thickness for the frame structure. The doors feature three 1" steel locking pins, along with three 1" steel hinge pins. All doors open toward the inside as to prevent being trapped inside from fallen debris. The doors are also equipped with large vents with mesh screen for air circulation. The locking pins lock against steel blocks to allow emergency personnel to enter the shelter in the case of an unconscious person inside. 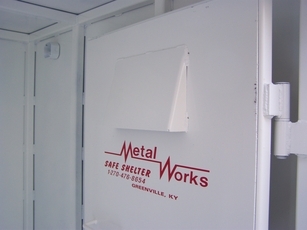 Metal Works can custom build a tornado shelter, storm shelter or safe room to meet your needs.